Sponsored by Tampa Electric Co.
On Tuesday, February 26, 2019, the Greater Riverview Chamber of Commerce (GRCC) hosted their monthly event at The Regent, 6437 Watson Road, Riverview, FL. Long-time friend and member of GRCC, Tampa Electric, hosted this month’s luncheon. Pastor David Jasper, Calvary Church, provided the day’s invocation. President Elect Mike Jones, World's Finest Chocolate, welcomed everyone to the luncheon and invited the Board of Directors and Past Presidents to introduce themselves to the crowd. 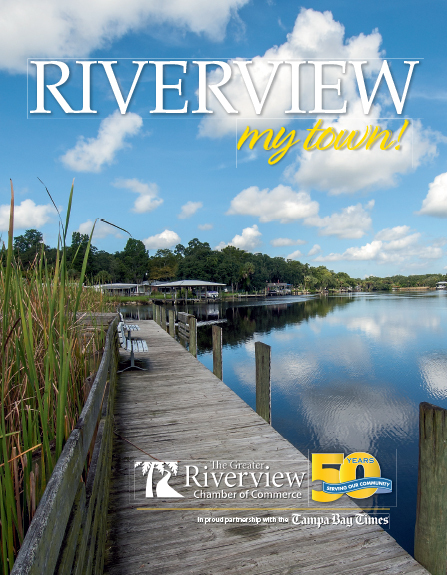 Leading the group this month in reciting the Pledge of Allegiance was 2019 Honorary Mayor of Riverview Bill Andrew of Aldea Green - Eagle Senior Living. Rich Rohde, R Processor, Inc welcomed USMC Major (retired), Jim Haney, and presented recognition for his many years of dedicated service to this country. Recognition was also made for distinguished guests Melissa Snively, Hillsborough County School Board Vice Chair – District 4 and Mark Proctor, Hillsborough Soil and Water Conservation District. Mike thanked Vince Bowers with Hillsborough County Park & Recreation who has transferred to the Westchase Recreation Center and welcomed Kisha Perry, the new supervisor for Gardenville. Doug Driggers, Tampa Electric Co. (TECO) Regional Manager introduced Tom Hernandez, Tampa Electric Co. Senior Vice President of Distributed Energy and Renewables who provided exciting news about the latest happenings at TECO. One item that caught most people’s attention was the Big Bend Modernization Project and the renewables update. Also at the podium was Golf Tournament Chair Christian Beiter, Preservation 1st Financial Group, LLC, to encourage everyone to mark their calendars for Saturday, March 2nd so that they could either attend or play in GRCC’s annual golf tournament OR just buy chances for the annual Bryan Hindman Ball Drop and the oversized Wagon of Cheer. No golf experience required! The 2018 Shining Star Award winner Isabella Rosal, Tea, Bowls and Desserts was recognized during the Luncheon. The Shining Star Award was created by the Board of Directors in 2010 to recognize a member that shares their talents, volunteered their time and displays their community spirit and must be a member that has recently joined the chamber. During the luncheon, Elijah Heath, Edward Jones welcomed 18 New GRCC Members who were presented a 2019 Greater Riverview Chamber of Commerce membership plaque to proudly display. 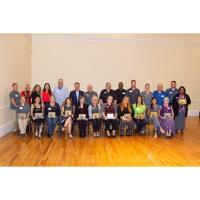 Kendra Wilson, Suncoast Credit Union provided recognition to all renewing members who were present at the luncheon. Attendees were encouraged to attend the next GRCC Membership Meeting Luncheon scheduled for Tuesday, March 26, 2019. The March luncheon will be sponsored by Livy O's Catering Co. The GRCC luncheons are typically held the fourth Tuesday of every month from 11:30am-1:00pm and the public is welcome to attend ($30 charge for non-members). RSVPs are requested. Please call the chamber office at (813) 234-5944 or sign up online. Photo courtesy of Ed Booth, Huth and Booth Photography. Melody Marrs, Goodwill Industries - Suncoast, Inc.